Erica Synths Drum Mixer with extended headroom and a dedicated drum compressor of unique design keeps each drum sound clearly distinguishable and adds power to the final mix. Bonus feature - effects send output allows to apply external effects to the signals on the first three inputs. LEDs next to each input give visual feedback on the signal level. 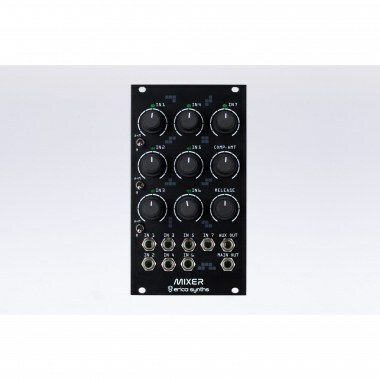 Eurorack модули Erica Synths Drum Mixer Вы можете купить по выгодной цене в наших музыкальных магазинах в Москве и Санкт-Петербурге, интернет-магазин, доставка по России. NB! Depending on the demand shipping can take up to three weeks.